The CA series' corrosion-resistant aluminum alloy body, drip-proofed with silicon rubber gasket, is made for handling the packaging of watery items. The user is secure in the knowledge that the air pedal used for directing the work process uses no electric parts. The sealer comes standard-equipped with a tilt table whose angle can be adjusted to 5, 30, and 45 degrees. At the time of factory shipment, it is adjusted to 5. This allows the sealing of bags without spilling the liquid content. Not only good for watery items, CA series is easy to use with the simple touch panel operation. Use the touch panel on the control unit to set conditions such as the heating time, cooling time, and the time for auto-cycle interval. To set the settings, use the Mode Switch. After setting the appropriate sealing condition for the packaging material, select either automatic continuous operation or manual air-pedal operation. A specially made stand is available for the CA-300 series of sealers for use when no other appropriate place can be secured to set the machine. 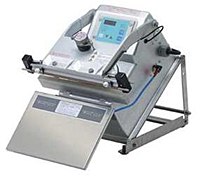 The CA-450 series of sealers comes standard-equipped with a standard table (without switch). CA Stand Type S and Special Table for CA-450/600 are also available. If you need a table for the CA-600 Series, use the CA Stand Type S combined with the Special Table for CA-450/600. Good for seal lengths of 300mm/ 11.7″, 450mm/ 17.5″, and 600mm/ 23.4mm as well as for seal widths of 5mm/ 0.19″ and 10mm/ 0.39″. Single-side heating type is capable of sealing materials up to 0.3mm/ 11.8mil thick while the double-side type is capable of up to 0.4mm/ 15.7mil thick pouches in total overlapping sheets. Each unit features the the anti-finger jamming feature and the timer to prevent overheating. Impulse Sealer: Ready for use as soon as the power is turned on.